A DEBATE DISASTER WAITING TO HAPPEN | "Global Possibilities"
There was not much of a contest in Wednesday night’s forum with Hillary Clinton and Donald Trump. Mrs. Clinton answered the questions of the moderator, Matt Lauer, in coherent sentences, often with specific details. Mr. Trump alternated between rambling statements and grandiose boasts when he wasn’t lying. 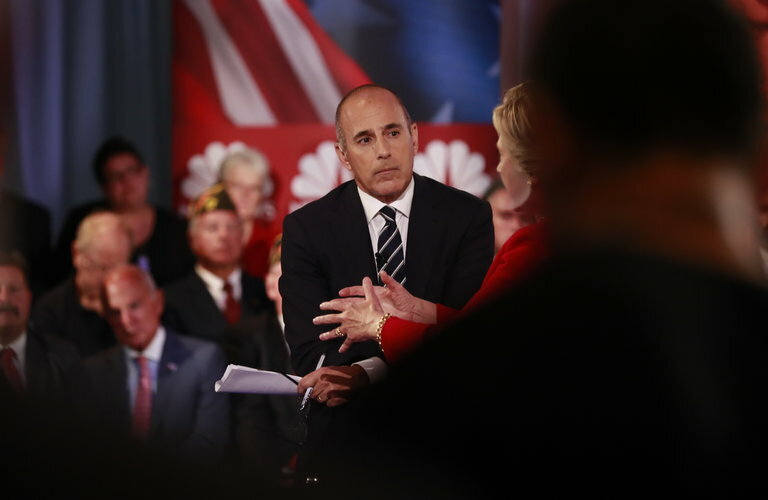 Mr. Lauer seemed most energized interrogating Mrs. Clinton about her use of a personal email server while secretary of state. Focusing on it meant that other critical issues — like America’s role in Afghanistan and its ties with China — went unaddressed. He was harder on Mrs. Clinton than on Mr. Trump, reflecting a tendency among some journalists to let Mr. Trump’s deceptions go unchallenged. That certainly was the case when he let Mr. Trump attack Mrs. Clinton for voting for the Iraq war and going into Libya when Mr. Trump had supported those actions. Disputing outright lies may actually be one of the easier challenges for a moderator. The harder task is to pierce fantasies and gibberish. That requires preparation and persistence. Mr. Trump was asked to explain his qualifications to lead the armed forces. “I have great judgment,” was his response. Fortunately, despite the lack of a follow-up question to that non-answer, Mr. Trump was perfectly able to display his abysmal judgment. He repeated his view that President Vladimir Putin of Russia, who invaded Ukraine and annexed Crimea, is a better leader than President Obama. He denigrated America’s generals as having been “reduced to rubble.” He talked in circles about defeating the Islamic State, boasting of a secret plan that he would not share. Mr. Trump reinforced his reputation for misogyny by defending his tweet from 2013 suggesting that sexual assaults were to be expected if women serve in the military. And, prompted by an audience question, he adjusted his immigration policy on the fly, suggesting that immigrants who join the military could avoid deportation. Lucky for him, no one bothered to ask why he should be allowed to be commander in chief when he spent so much time attacking the parents of a Muslim Army captain killed in Iraq. Earlier in the day, Mr. Trump called for a huge expansion of the military that experts said would cost an extra $150 billion over a decade. He gave no hint where that money would come from. At one point, Mrs. Clinton, trying to assure the audience that she would use military force judiciously, said, “We are not putting ground troops into Iraq ever again, and we’re not putting ground troops into Syria.” This left unanswered the question of whether she had made a promise she can’t keep, particularly since there are some Special Operations forces in both battlefields now. There will be many issues to explore at the three presidential debates. For the sake of the nation, the moderators need to be fully prepared to challenge the candidates, so voters can have a clear picture of how they will lead. Thank you for a seemingly balanced and responsible article. The points are well made and flow sequentially. It will remain to be seen if the Republican narrative ( and Trump’s prevarications) will be challenged incisively. That will depend entirely on the integrity and courage of our ‘Fourth Estate and if they retain any sense of the mission that is entrusted to them. That will require all of us to pull our heads out of the sand and try to achieve a more lofty view than the venial demagoguery that has been the staple of our public discourse over the last two decades. I am just a common man who still believes in the capacity of the American people to be great, but that requires accurate information and honest reporting and most critically a willingness to see that no one is prefect and we are all in it together. We always have a choice to make. I pray we will make the one that ties us mostly closely to our best values. Lastly, we need to remember to pitch the ad hominen attacks, and instead focus on making our leaders live up to the trust we invest in them. The seven sins are always the same and we will get what we deserve and model for the rest of the world.